Rev. 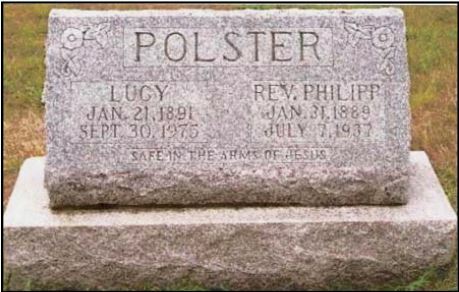 Philip Polster was the son of Johann George Polster and Anna Margaretha (Purtzer) Polster. He married Lucy Mueller, daughter of Heinrich Fuercutegott Mueller and Katherine Kieninger. He was a student at Concordia College in Ft. Wayne, Indiana and later entered Concordia Seminary in St. Louis, Missouri. Following his time at the seminary, he led congregations in various towns in Nebraska before retiring to San Antonio and El Paso, Texas. His obituary from the Rockport Democrat cites two brothers at the time of his death, Henry of Schribner, Nebraska, and Walter of Evanston. A third brother named Albert predeceased Philip by 15 years. The obituary also names four sisters, Mrs. Henry Braun of Evanston, Mrs. Zabel of Austin, Texas, Mrs. Walter Uebelhack and Mrs. Fred Reialfski of Indianapolis. This entry was posted in Spencer County and tagged Mueller, Polster on July 14, 2014 by oahblog.